The policy statement on tourism as presented at the June 2003 Tokyo Donors' Conference by Mr. Hari Selvanathan, Chairman of the Committee appointed by the Prime Minister to restructure Sri Lanka's tourist industry. Note that Living Heritage's Sustainable Development Zone in Koslanda is now part of official Government policy. 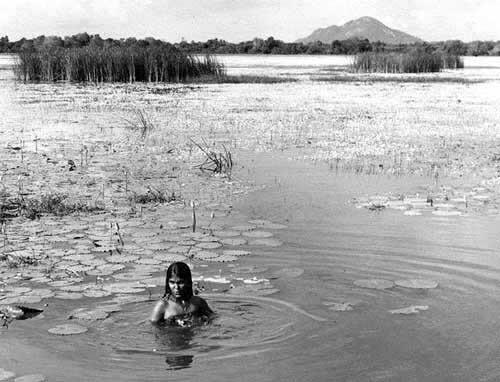 Serendipity Regained: Girl bathing in village tank in the Wanni. Mr. Prime Minister, your excellencies, distinguished guests, ladies and gentlemen. Let me begin by asking: what do we mean by ‘Regaining Sri Lanka'? What is it that we wish to regain? The 20 year conflict in our midst has given the hospitality industry an opportunity to redefine the concept of ‘tourism'. Sri Lankans all agree now that we need another path — one leading to peace, justice and prosperity. We have learned not only from our successes and failures, but also from those of rival destinations. Sri Lanka is just waking up to its potential as Serendip, as Lanka was named by ancient Arab mariners. ‘Serendip' gave the English language the word ‘serendipity', meaning the faculty of sudden, accidental, and fortunate discoveries or experiences. By regaining Sri Lanka, we mean ‘regaining serendipity'. We want to offer visitors an authentic experience—unique to Sri Lanka—of original serendipity. Just as you would like to offer satori to everyone who visits Japan, we aim to offer serendipity. Today I am addressing two segments of this seminar's tourism industry audience: those of you directly servicing the Japanese market; and those representing prospective investors in Sri Lanka's hospitality trade. The task given to me by my Prime Minister is to head the process of restructuring Sri Lanka's tourism sector. We are developing a new strategic initiative that would make Sri Lanka "the most sought after destination in the Indian Ocean". While offering authentic experiences in a unique set and setting, we will leverage our human and natural resources to transform Sri Lanka into the region's centre of excellence. We are home to a cultural rainbow of humanity living ordinary life in extraordinary ways. This new approach to tourism will restore pride in local culture, raise living standards and promote social contentment. In so doing, Sri Lanka will become a recognized up-market destination catering to niche markets. As a businessman, I am excited about the possibilities of the coming boom and I am delighted to be a part of its formative stage which, we hope, will soon make Sri Lanka the gateway to South Asia. We business people have to acknowledge the vital role of Japan in this seminar, which lays out our strategic objectives and how we aim to achieve them. Our Japanese counterparts in Colombo and Tokyo have encouraged us to highlight tourism in these briefings. Sri Lanka's low-capital intensity, geographical diversity, and capacity to mobilize visitors quickly have been recognised as potent forces in driving our economic recovery forward. Our Government has taken an enlightened stance by introducing new legislation, establishing fresh standards, and creating new infrastructure, together with tourism-related national zoning, all with a regional focus that recognizes and respects our island's remarkable cultural diversity. This new face of Sri Lankan tourism presents a dazzling array of possibilities. World Heritage sites, vibrant Buddhist culture, tropical wildlife, unspoiled beaches, traditional healing therapies, wind surfing, whale watching, diving, fashionable shopping and dining are just a few of the attractions that distinguish Sri Lanka as a destination for our visitors from Japan, both young and old. We have identified Eco-tourism, Adventure Tourism, Heritage Tourism, Agri-Tourism, Nature Tourism, and Sports Tourism for sustainable tourist development. In fact, we are now about to launch Sri Lanka's first Sustainable Development Zone, featuring a blend of traditional hospitality and agriculture. As any visitor can tell you, Sri Lanka contains several worlds. Besides our incredible bio-diversity, we are also blessed with a startling cultural diversity that includes Buddhist, Hindu, Christian, Muslim and indigenous populations. Like Japan, Sri Lanka is also a rice-growing culture with fish as a staple food. Our rural inhabitants are mostly rice cultivators and our coastal people are hereditary fisher folk. ‘Regaining Sri Lanka' is also about recognizing, restoring and celebrating this cultural diversity. In legend and history, Lanka was always regarded as being somehow different and magical. That Lanka or Serendip still exists for every adventure-minded visitor, regardless of where he or she comes from. It is this magical isle that we now offer to the world, a land where every attraction is less than a day's drive. Lanka is now fully safe and secure for all visitors. The ceasefire has now remained intact for the past 18 months. There is a great deal yet to be worked out, but what is important is our unanimous commitment to securing and sustaining a just and lasting peace. With Sri Lanka's return to peace, we are now embarking on a bold journey that will re-establish our ancient reputation as Serendip or Dharma Dwipa, the Island of Dharma where gods and Buddhas have trodden. Even the dark cloud of conflict had a silver lining. For decades while the prime attractions of neighboring countries have been overrun by visitors, Sri Lanka remained largely unvisited — and thus unspoiled. We now invite you to be our guests. Our boutique hotels and restored heritage properties like the Galle Fort World Heritage Site deserve your hands-on inspection. Renowned hotelier Adrian Zecha of Amman Resorts fame, who will speak next, has already selected three prime locations in Sri Lanka for development. Thanks to the progressive leadership of our pragmatic Prime Minister, Sri Lanka's investment climate is also rapidly improving. We have fair and flexible labor laws, predictable, even-handed tax structures, and an eager, affordable and highly trainable work force. Our national network of roads, power grid and Colombo international airport are all being upgraded. Tourism infrastructure services, like transfers by air, land and water, are also fast improving. It is an age of sweeping change for Sri Lanka. "Ceylon is the cradle of the human race, because everyone there looks an original." Ladies and Gentlemen, it has been my pleasure to introduce Sri Lanka, ‘A Land Like No Other'. Thank you!